May is National Bike Month, so we’re exploring ways to make commuting by bike easier and safer. Whether you ride your bike for fun, to get fit, save the environment or get around town, we’ve got recommendations on how to make cycling better for everyone. One way you can celebrate this year is participating in National Bike to Work Day, on May 19th. If this will be your first time biking to work or you’re nervous about jumping back into the saddle, here are a few tips to get you started. Plan your route. Google Maps is a good way to find bike friendly streets by selecting the “bicycling” option. Keep in mind that your preferred route by car won’t always be the safest option while riding a bike. If you’ll be taking your bike with you on to public transit, make sure there aren’t any limitations on how many bikes can be accommodated. Check your bike. If your bike hasn’t had much action lately, double check your tires and brakes. It’s also always a good idea to make sure your chain is well lubricated and free of debris. Take a short ride around the block just to make sure everything is in working order. Safety first. Before leaving the house, put on your helmet and reflective clothing to help with visibility. Depending on where you live, there may also be legal requirements for a front and back light. Both are especially important when cycling at night. While riding, watch for opening car doors and follow regular traffic laws. 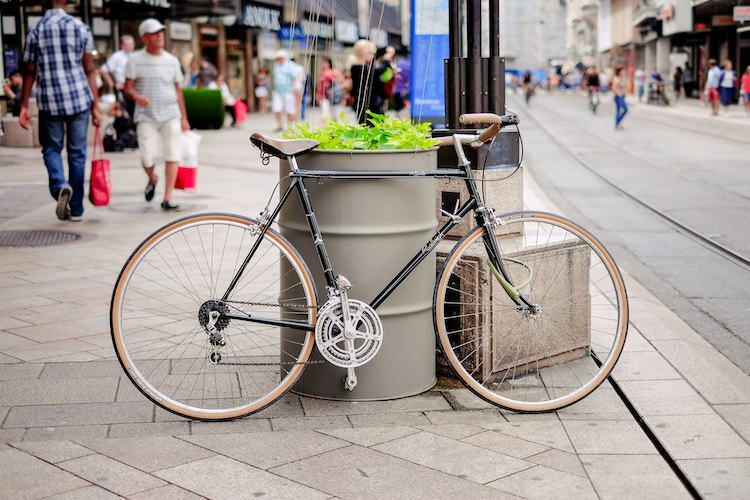 Once you reach your destination, be sure to lock your bike securely. Pass with care. Give bicyclists a 3-foot buffer while passing, and on multi-lane roads, switch lanes to ensure there is plenty of room. Exit safely. Always double-check for cyclists before opening your door. Mind your speed. Increased speed can mean the difference between an injury and a fatality. Follow speed limits and use caution while driving near bicyclists. If you find that you’re biking more often than driving, Metromile’s per-mile car insurance could help you save. Head over to www.metromile.com/insurance to learn more.